My lovely friend Carolyn released her 2nd cookbook, Easy Keto Dinners, this week and I was absolutely thrilled to receive a copy from her. I’m not keto but since I do follow a paleo diet most days of the week (okay, some days of the week), a lot of her recipes are perfect for me. No sugar, no grains, no legumes. It’s high fat, low carb which is exactly what I try to follow. 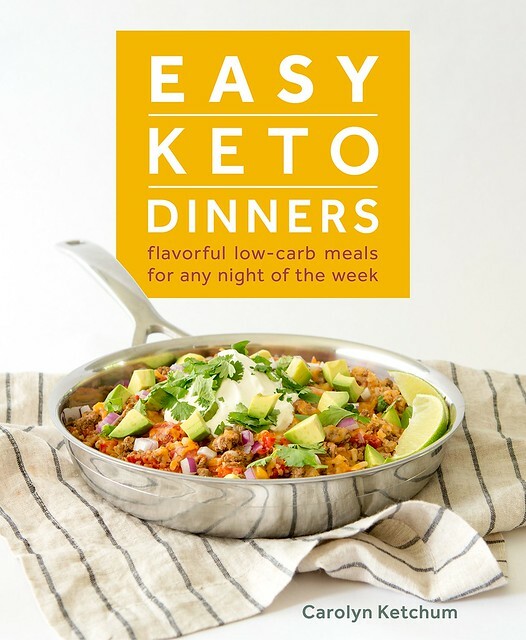 The book is beautiful and it’s exactly what it says it is: keto dinners that aren’t going to take you all night. It’s divided into sections based on the protein you want and there’s even a vegetarian section. Plus, she’s got some staple recipes for things like keto ketchup, cauliflower rice pilaf, and refrigerator pickles. There are slow cooker recipes, sheet pan meals, recipes that can be prepped ahead. If you are following a keto diet, this is a must buy! Also, I reviewed Carolyn’s first book The Everyday Ketogenic Kitchen a few months back and shared a recipe for her Chicken Thighs with Creamy Rosemary Mushrooms. Can you tell I love her chicken thigh recipes? This recipe is actually really simple, Everything (besides the zucchini noodles) is done in the same pan and it took me about 20 minutes to throw it together. The chicken thighs get crispy and they’re covered in that rich, delicious sauce made from butter, heavy cream, garlic, Parmesan, AND feta. Plus, bacon and spinach. Seriously, this is my idea of perfect chicken. Zucchini noodle tip: I don’t cook mine because they get mushy and gross. What I do is spiralize them, put them in a colander (with a bowl or something underneath), and then toss them with a tiny bit of salt. So that gets rid of some of the liquid and softens them up a bit and then I find that whatever hot sauce you put on top is warm enough to steam them to a good texture. 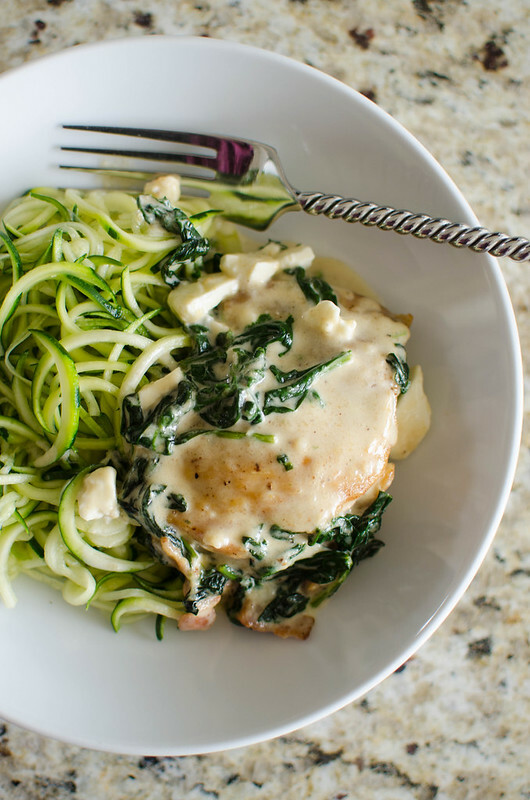 Or if you don’t want zucchini noodles, put it over cauliflower rice or sweet potato noodles. Whatever you’re into! In a large skillet over medium heat, cook the bacon until crisp, about 5 minutes. Remove to a paper towel-lined plate to drain , leaving the bacon grease in the pan. Season the chicken thighs with salt and pepper and place in the skillet, laying them flat. Cook for 4 minutes per side or until cooked through. Remove to a plate. Add the butter to the skillet. When melted, add the garlic and cook for 1 minute, until fragrant. 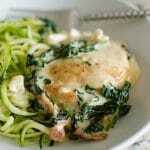 Add the spinach and saute until wilted, 2 to 3 minutes. Stir in the heavy cream and Parmesan and cook until thickened, about 3 minutes. Add the bacon to the sauce and stir to combine. Return the chicken to the skillet and toss to coat. Sprinkle the crumbled feat over the top. 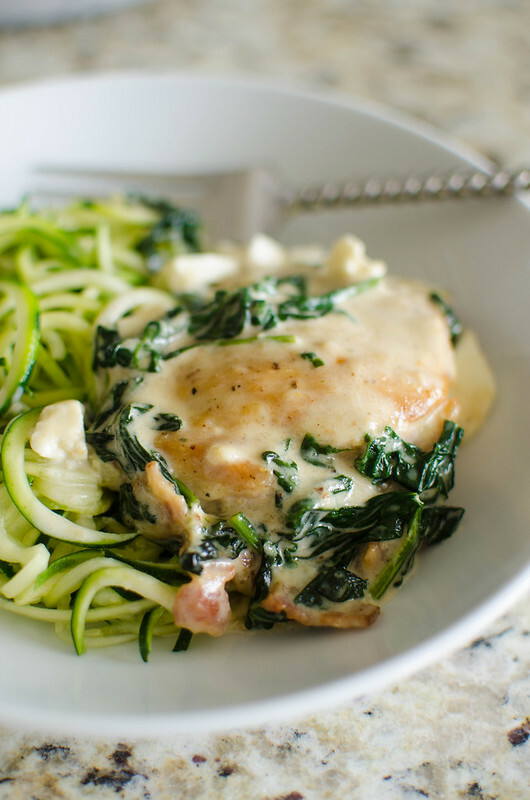 8 Responses to "Bacon Spinach Feta Chicken"
Creamy chicken like this is my fav! Perfect for my diet schedule! All of my faves in one dish? Yes, please!! Pretty sure my kids are going to devour this too! So creamy and delicious! I’m going to have to try this. Love this so much! I love anything with feta! This looks perfect! I would rate this 10 stars if I could! HOLY YUM! This looks like such a delicious meal! I love the combination of flavors!